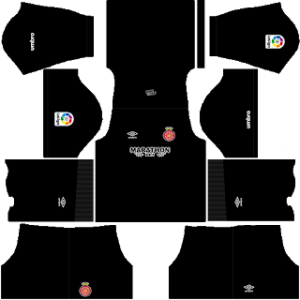 In this article, you can find and download Dream League Soccer (DLS) Girona Kits and Logos 2018, 2019 Edition with URLs. Girona FC is a professional football club from Spain. It was founded on 23 July 1930, 88 years ago. The club plays in the La Liga the top division football in Spain. Overall Girona is a very strong team and gives a good competition to its opponents. Girona plays its home matches at the Montilivi, Girona which has a capacity around 13450 seats to accommodate. Eusebio Sacristán is the current manager of this young Girona side. It will be a pretty difficult task to compete with the top level clubs. Many great players play in the La Liga as it is one of the top 5 leagues in the world. Now you can download the kits of your favorite teams and play Dream League Soccer 2018 with it. Download Girona Dream League Soccer kits from the below URLs. In order to change the kits and logo of your DLS team, you will need the URLs. So in this post, we are providing the Dream League Soccer Girona kits and logo with URLs. 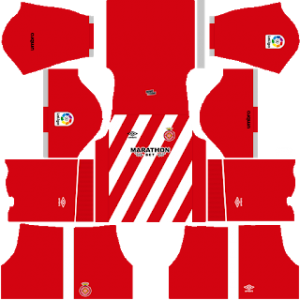 The kits and logo are presented in the size of 512×512. Play and enjoy the game. The Girona home kit is a mixture of red and white with red being dominant. 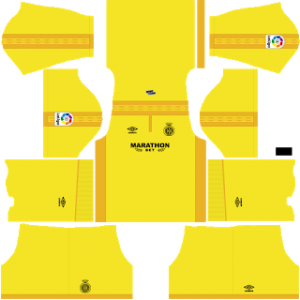 The kit consists the logo of the sponsor and the team. You can download this kit and use it with your team. The kit color is bright yellow with patterns all over the kit makes it unique and looks attractive. The players wear this kit while playing an away match. 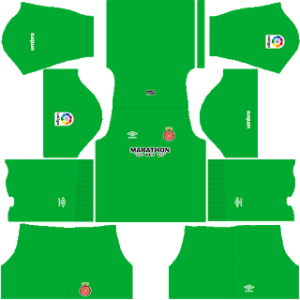 The Girona goalkeeper home kit is not the same and is colored dark green with certain patterns at the bottom of the kit. Play with this kit by downloading it from below. The kit is full black with countable white linings and the goalkeeper uses it at an away match. The kit contains certain patterns which give an attractive look to the kit. On top of the Girona logo, there is a crown which symbolizes them as the kings. It is a circular logo with a square in the center. A unique design is filled at the center. You can use this logo in DLS by downloading it from below.